Forgot email account | Forgot your password? 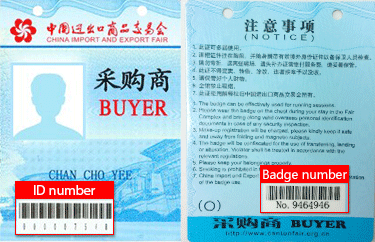 Tips: You may use your Canton Fair Buyer’s Badge number (9 digits) to log in your account; the 7 or 8-digit number on the backside of your badge may serve as the initial password. Please use your new password to log in after activation of your account. Due to the upgrade of the Buyer E-Service Tool platform(BEST), please follow our guidance to upgrade your personal account after this login. We apologize for any inconvenience caused.